Messages comes with every Mac and iOS device. It's a simple messaging app that allows you to send messages to anybody after establishing a link through either their telephone number or email address. One of the bonuses of the messaging component of Messages - iMessage - is the ability to send a group message - as long as everyone is using an iDevice. It's very easy to use after setting up the account and will sync messages across all your Apple devices (usually). If you could message Android users using iMessage it would be a little more useful, for now messages sent to your non-iPhone wielding friends will go via a standard text message with an associated charge. 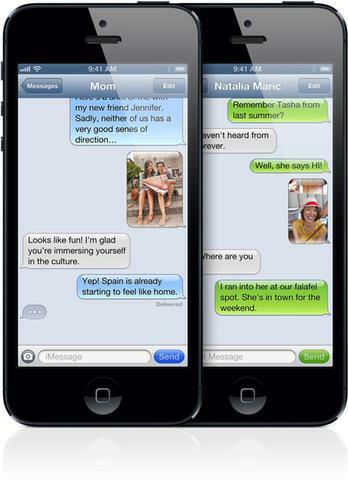 WhatsApp Messenger allows you to send text messages, videos, pictures and audio to your friends or family at no cost. When working with large video/audio files it an take a lot of time to send a file, which could impact on your data usage. The quality of the videos/audio files sent is superb. WhatsApp is easy to use, operating much as you'd expect from a messaging app. You can message individual contacts or create groups so that all messages from a particular set of friends or your family appear in one place. The always on aspect of WhatsApp is useful: the app uses push messages to let you know when a message has been received and all you need do is touch the message to go to WhatsApp and view the rest of it. Skype is a versatile messaging app that was acquired by Microsoft in 2011. Developed initially to offer high-quality VOIP communication, allowing conversation between computer and land line as well as between computers; the app was expanded to offer high-quality video conversation between two users on most current devices. For a long time the feature set of Microsoft Messenger (formerly MSN Messenger) was starting to nip at the heals of Skype. Within the last year, however, Microsoft announced that the Messenger service was to be disabled and all users migrated over to Skype. As a messaging app it's good: you can share short videos, send simple text messages and so on - much as you'd expect from a messaging app. It's best for quick and simple messaging. The key functionality of Messenger is available within Skype - the ability to video chat with, and message, friends/family within one app. Setting up Tango takes a few seconds. Once you've downloaded the app it searches your contacts to see who is available within the Tango network: you can add others either by their telephone number or email address. Making a call is then a matter of touching the contact within your contact book. The quality of video calls depends very much on the quality of the Wi-Fi signal available to you. If the WiFi signal is poor, video may become disjointed from the audio; with the app playing catch up to get all the buffered video over the service. If you're making a voice-only call the end result tends to be better once the connection is made. The ability to switch between voice and video at any point is nice; and you can send messages with an array of smileys. A few are free, others you need to pay for - either way it's a nice additional touch. It's a nice app, with a few nice bells and whistles. It's let down by the quality of the video and the time it takes to establish a reasonable connection. Everybody knows Facebook: the social networking site that took the world by storm. Through the Facebook app you can upload/view pictures, send messages and keep up to date with the goings on around the world quickly and easily. The experience is fast and fluid - unlike conventional text messaging when your message is being replied to on Facebook you'll be told so on screen. You can send photos, short videos and audio within the message stream too. Kik Messenger offers some nice features. You can message for free, to both individuals and groups, across multiple operating systems. You can send picture mail and content either as a sketch, YouTube video or image. Messages can be viewed offline; and when you go back online there are a number of customisable notification options. Being able to send messages to up to 12 contacts at once is a nice touch: if you run a club or user group you don't have to send multiple messages, just one to everybody and in a fraction of the time you otherwise would. Snapchat is a messaging app focused on images or videos. Take a quick picture or video, add a caption then send it to your friends. The emphasis is on the ease and speed of this operation, so in transmission the quality of the pictures does tend to suffer. Its aim is to bring more of a personal touch to this form of messaging rather than just text-based one liners. It works well enough; in common with the other apps in this feature your recipient will need to be on the Snapchat network to make use of the app.